In the wake of social media imploding, the new web is starting to decentralize. As part of this, specialized social media has arisen, taking on a role more like a forum than trying to be everything-for-everyone as Facebook, Twitter, and Reddit attempt to. One of these start-ups is a powerful Facebook-style service called Utterz which advocates open discussion, or free speech — within limits, eliminating the illegal, spammy, off-topic, and so on — for the purpose of getting to an understanding of one another. Founder James took out some time to give us the low-down..
What spurred you to start Utterz? Seeing the great power that seems to be concentrated in the hands of just a few technology firms spurred me on. I have felt first-hand the effects of building a business that relied on traffic from a major search engine and that search engine then decided to slowly push my website down the search rankings destroying that business that I had invested so much time, effort, and money into. I think people are waking up to the dangers that are posed by the monopoly technology giants and are looking for alternatives to use, after all we give them power by using them, and so there power can be taken away if we all just stopped using them and ignored them. We now live in an information age and they act as gatekeepers to this information, they track and record everything you do, they can now influence elections, destroy or build businesses (by deciding who ranks and who doesn’t) and censor opinions they don’t like and promote ideas they do like. What is your vision for the site, meaning that ideally, what role would it serve and how would it operate? Utterz is a social network with a vision based around the principles of free debate amongst users. As the famous quote puts it “I disapprove of what you say, but I will defend to the death your right to say it.” I believe that is a good starting point for a social network. We all have heard or read about the social networks starting to censor free speech and hide views they disagree with. At Utterz we believe that the only place for “hate speech laws” is in a George Orwell novel. How many users do you have, and is this number growing? We have around 1000 accounts and this is showing steady growth month on month. What software do you run, and how complex is the setup required to get this sort of site working? The social network runs on a LAMP stack (Linux, Apache, MySQL and PHP). I have some IT experience so it isn’t too hard for me to set up the website. Can you tell us a little about yourself, and your history with the internet, and what made you supportive of free speech sites in the first place? My name is James and I am a Christian and this means by current mainstream society standards some of my views regarding absolute truth and sin are deemed offensive and judgmental (views that roughly 50 years ago were actually mainstream) and this means I can potentially be a target for censorship. I am 25 years old and have grown up using the internet and the reason that I am interested in free speech on the internet is because censorship is one of the biggest threats to free expression on the internet and a threat to freedom in society as a whole. Do you think that the internet is “redecentralizing,” or getting away from the One Big Site or One Big Search Engine model? I am unsure at the moment. Ideally, you would want it to decentralize with less power in the hands of the large companies but if you ask a hundred people on the streets what search engine or social media platform they use, the overwhelming majority will use the well known “Big Sites.” Only a small niche segment of savvy users will admit to using alternatives however there is a growing trend to use alternative websites. I think also another real problem with censorship is that the tech giants are sneaky. The average person may not even know that they are being censored because they might have been shadow banned so do not question it. Do you feel that censorship can be effective, either on the internet or off? Does censorship seem to legitimize what is censored? Social media sites do have a responsibility to censor certain content such as paedophilia, terrorist propaganda and counterfeit drug sellers. Sadly instead of focusing on eliminating this kind of content from the internet, the internet tech giants are using their resources to censor peoples political views and opinions rather than go after the things that pose a real danger to society. If a social media company tries to be the ombudsman of discourse online determining what should and shouldn’t be seen on its platform their will always be some form of bias on that social network. Getting rid of the algorithms and going back to the basics is what is needed. It should be up to the users to decide what they want to share, like and who they want to follow or not follow. Do you think that current Big Social sites censor, and why do you think they do it? I believe that big social sites are abusing their monopolies and have no respect for their users. Almost everyday we are hearing news stories about how the tech giants such as Google, Facebook and twitter are censoring its users. For instance one example of many of censorship online that many may not even realize is that Google has teamed up with Disqus the online commenting platform to develop a “toxic comment filter” system. This system uses AI to intrusively scan peoples comments for “hate speech” and then censor them in real-time. I believe that the reason that the big tech giants do this is for control and they wish to push their political views, beliefs, and to silence everybody else. There is good reason why these tech giants censor their users and pay politicians across the world millions every year in “donations”; it is to inflict their agenda onto the rest of the world, tighten their grip on society, and limit everyone else who might oppose them. What would an internet without censorship look like, and would it make the problems of humanity better or worse? I think about this a lot and I would argue for some limits within the existing law (although due to the Internet’s global reach which law would we follow? Do we need international law?). When you post something on the internet it is not much different from publishing a book and you have to exercise some responsibility and make sure that what you are saying is factually correct. Due to the permanent nature of the written word it can be much more damaging and there is the potential to commit defamation (However, sometimes fake threats from companies and individuals for defamation can be used as a powerful weapon against innocent individuals to scare and censor them) and really hurt peoples businesses so bad people could really hurt other people through a targeted negative publicity campaign. If people want to support Utterz, how can they do it? You can sign up for a Pro account, this has extra benefits such as allowing you to promote your postings. All money we raise from these subscriptions go into paying for our web hosting which is the biggest day to day cost for the business. 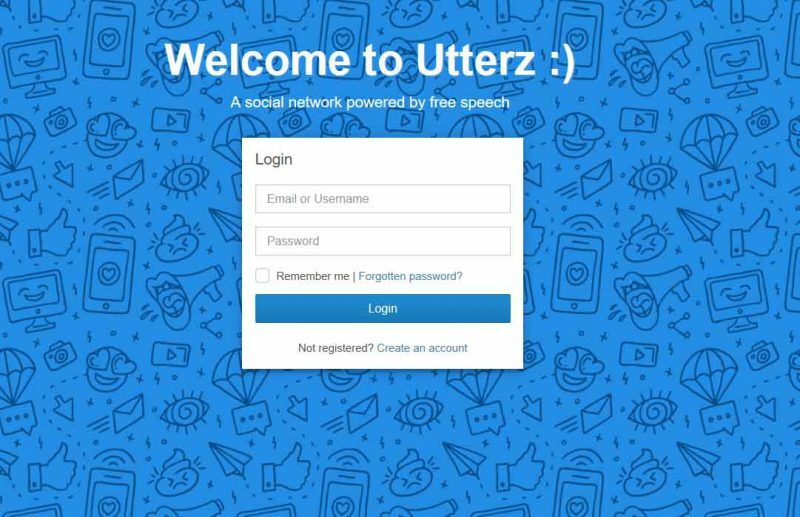 Also linking to the site and spreading the word about Utterz can also help us to compete against the big tech giants and fight their censorship.